Global investors gear up to working with Narendra Modi despite reservations about his secular credentials. Narendra Modi recently found support from an unusual quarter. Tulsi Gabbard, a member of the US House of Representatives, opposed a proposal to boycott Modi - even if he becomes the Prime Minister of India - at an April 4 hearing of the Tom Lantos Human Rights Commission. A Democrat, Gabbard comes from Obama's home state Hawaii and is the only Hindu in the Lower House of the US Congress. She minced no words in criticising the Lantos Commission - a panel of the House of Representatives - for taking up the petition on Modi, calling it an effort to influence the ongoing elections in India. Obama administration's representatives chose to abstain from the hearing. Indeed, as the above example illustrates, Modi's rise to prominence in the past few months has captured global attention. The Obama government itself is mulling its approach to Modi, the Bharatiya Janata Party's (BJP) prime ministerial candidate, if he is voted to power. It was in 2005, amidst allegations of his involvement in the 2002 riots in Gujarat, that the US government revoked his business visa and subsequently the UK administration also issued an embargo. Global investors, too, are following the electoral battle in India closely. 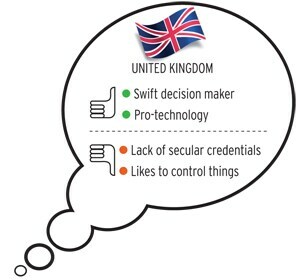 In their reports, several financial giants, such as Goldman Sachs, HSBC, Citigroup, CLSA, Bank of America Merrill Lynch, Nomura and Barclays, came out with their assessment of the political situation in India and almost all of them indicated that Modi is the favourite to become the Prime Minister. The Economic Times reported that some foreign brokerages are offering investors a "Modi Basket"of stocks that are likely to gain if he comes to power. The report did not have the brokerages or the stocks. Significantly, most of financial institutions praise Modi's governance style. Japanese brokerage house Nomura has predicted that if Modi is voted to power the Indian currency might strengthen to Rs 58 against the US dollar and the GDP growth rate might climb to six per cent by the end of this financial year. But many of the economists with these institutions admit privately that if Modi comes to power, it will be a test of his secular credentials and his ability to carry different sections of the society along with him on important policy decisions. "His commitment to secularism will be tested, if he comes up as a winner in these elections," says an economist with one of these banks. The international magazine, The Economist, in a recent story on Modi, expressed the same reservations. A.V.T Shankardass, a motion picture financier in Hollywood, says that after the collapse of Lehman Brothers investors are very cautious. "They get scared when they hear that a possible future prime minister of India has a Hindu nationalist ideology. Then these investors may keep India in the same league of Islamic countries." But other analysts say any apprehensions about Modi would be allayed by his strong governance track record in Gujarat. 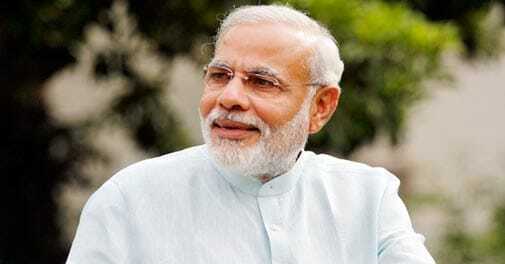 "Some of the Muslim leaders might fear Modi for his alleged involvement in the riots. But most of the investors trust Modi's track record, and would not hesitate to invest in his regime," says Jai Seong Song, a former minister in the South Korean government. On the ground, business houses in the US, the UK and other parts of European Union are happy with the prospects of Modi winning the polls. 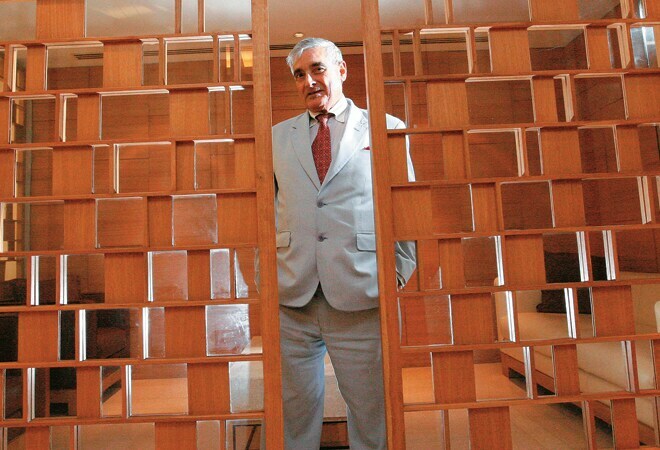 Ever since Modi released his party's manifesto, Business Today spoke to 17 of them. They have concerns about his unproven secular credentials, but are quick to add that if he comes to power, he would be accountable to the people and constitutional institutions. The biggest problem for India is policy paralysis and in some cases bad decision making, according to business honchos and investors abroad. "India's credibility as a strong emerging economy has taken a serious setback in the last two-three years due to perceived corruption, policy paralysis, and economic reforms process getting stalled," says Richard Sadler, CEO of UK's Lloyd's Register Group, a global engineering, technical and business services organisation. "Global investor sentiments are perhaps at the lowest level in the last two decades. The country is crying out for a politically stable government, good governance and revival of economic policy reforms process." Most of the global investors are hoping that the Modi-led National Democratic Alliance (NDA) gets a majority. "If Modi gets a clear majority or reaches near it, then he can be good for the economy. My suspicion is that a Modi government with a fractured mandate could prove to be another edition of the UPA regime with low-decision making," says R.K. Mehrotra, Chairman of London-based shipping-to-retailing Foresight Group. Mehrotra says he is holding on to his group's investments in the Indian oil and gas sector till May. If there is no clear majority government, he will opt to exit from the oil and gas blocks. There is another reason for Mehrotra to be wary of Modi. Pavers England's single-brand retail chain in India is a joint venture between Pavers and the Foresight Group. The BJP is known to be opposed to foreign direct investment (FDI) in retail, and there are fears this hostility may at some stage extend to single brand retail as well. However, he says it is not Modi who has apprehensions about FDI in retail, it is his party. "I heard his recent speech, where he was telling mom-and-pop shop owners to pull up their socks and get ready to compete with global players," says Mehrotra. Without naming Modi, Banmali Agarwala, CEO and President, South Asia at global energy and infrastructure giant GE, says that the new government would need to hit the ground running. "It is high time India encourages bold decision making," he says. While releasing BJP's manifesto on April 7, Modi committed his party to opening up most sectors to FDI except multibrand retail. He also promised that his government would reform and simplify taxation laws, land acquisition processes, labour laws, agriculture laws and would invest in infrastructure, including bullet trains, developing freight and manufacturing corridors. All these proposals are applauded by foreign investors. 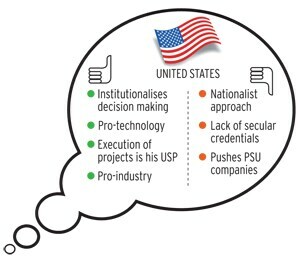 "But the foreign investors are suspicious, being a nationalist, Modi might want Indian companies to take most of the projects," says the CEO of a top American company operating in India. But most investors believe that a politically strong Modi would be able to push through contentious issues such as raising FDI in defence, banking and insurance sectors. "The manifesto talks about cutting red tape and simplifying procedures. We have had the same objectives here in the UK, which has turned our economy around quicker than anyone predicted," says Sadler of Lloyd's Register. "The manifesto is strongly in favour of FDI for job creation, infrastructure development, and inducting niche technology." India's nuclear policy is also being closely watched by foreign investors. In 2008, the US banked on Manmohan Singh to get the nuclear deal through. But various companies working in this space believe that Modi could take the deal to a logical conclusion. Today the most contentious issues are the liability clause and tracking the end-use of the fuel. Senior BJP leaders, who are part of Modi's team, say that they are ready to make changes in the liability act to make this accord work. "Today no supplier wants to come forward with this liability clause. There has to be some insurance framework around on compensation in case of any accident," says Naresh Chandra, former ambassador to the US. 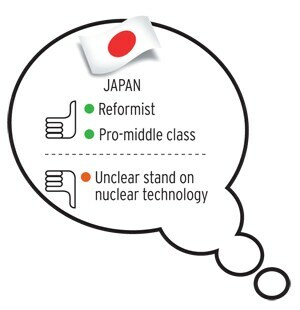 The BJP plans to overhaul the country's nuclear policy if voted to power. "Nothing has moved forward from the day of the deal. If voted in, our government will make things move in civil use of nuclear technology," says Murli Manohar Joshi, senior BJP leader. 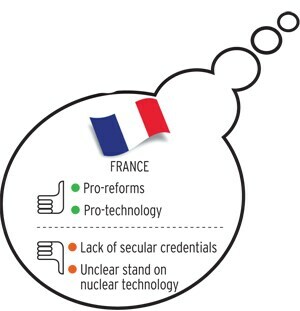 In fact, France is keenly pushing for an agreement on the Jaitapur nuclear power plant project. On the last visit of French President Francois Hollande in 2013, no agreement came about as the French partner Areva was non-committal on the liability issues. Modi is also keen to boost FDI in the defence sector. India is the world's largest importer of defence equipment - its arms imports are nearly three times that of China. "Today Modi does not have great relations with the US and the UK. This might work in France's favour," says an analyst. Modi is open for a hike in FDI in the defence sector, from the existing 26 per cent to 49 per cent, and in some cases even to 51 per cent. This is one of the long-standing demand of investors from the US, the UK, Italy, France and other parts of Europe. "If it truly goes to 49 per cent, it would allow people like me to go back to our corporate leadership and say now we have an opportunity to go and invest," said Jeff Kohler, Boeing's Vice President of International Business Development in Defence, Space & Security, at the Singapore Air Show, according to reports by news agencies. Meanwhile, Narendra Modi's growing proximity to China and Chinese companies may discomfit the US, say analysts. More than trade and business, US needs India as a counterweight to China in Asia. Modi has visited China four times and is actively seeking investments by Chinese companies in sectors like infrastructure, solar panel manufacturing, semi-conductors, renewables, port development and very high value-added products. "It would be in Indian interests to keep good terms with both the US and China," says Naresh Chandra, former Indian ambassador to the US. The Obama administration has not taken a final stand on the visa ban on Modi. If Modi becomes prime minister, it is most likely that he would have to travel to the US in September to attend the UN General Assembly in New York. Modi has so far maintained a discreet silence on the visa ban but the BJP leaders, who are part of Modi's coterie, including Arun Jaitely, Piyush Goyal and Arun Shourie, are believed to be in touch with Democrat Congressmen and Senators. The industry lobby group, US India Business Council, has also been lobbying with the Obama administration to revoke the visa ban on Modi. Delegations of US businessmen have regularly visited Gujarat in the past and met Modi. There have been investments from the US in Gujarat over the past decade, amounting to $14 billion during Modi's tenure without active involvement of the governments of the two countries. In February this year, US Ambassador Nancy Powell met Modi in Gandhinagar, amid speculation that the US was trying to bridge the trust deficit. Powell has since resigned. Her successor has not been named yet. Media reports suggested she has been eased out as she was perceived as being "too close" to the UPA's foreign policy establishment. But this was followed by the US State Department's clarification that there is "no change" in Washington's long-standing visa policy or in its "strong advocacy for human rights around the world". "It will be a juvenile decision for the US administration, if they continue with their stance of not engaging with Modi. They should respect the democratically elected governments, and deal more maturely," says Kanwal Sibal, India's former foreign secretary. Clearly, all eyes will be on the election results in India on May 16.